I have a Bachelor of Arts – Art All Levels from the University of Texas at El Paso that includes a Texas Teaching Certificate. In my 25 years of art education experience, I have presented to all age levels, from children in kindergarten to education professionals. As an artist, I incorporate Mesoamerican symbolism with Mexican-American historical experience. My purpose is to inform through a unique artistic beauty. Ancient messages are woven with a modern context for a unique visual experience. My presentations guide audiences towards an understanding of how the ancients maintained a lifestyle in balance with Nature. Mesoamericans used art to convey historical events, scientific data, cosmological events, and a philosophic perspective about human relations with Creation. The presentation compliments all academic subjects: art, math, science, culture, language and history. The term: “Visual Literacy” describes my art: an experience through art, history and culture. How to draw with geometric shapes: With these shapes we can draw anything and learn to write with them. Draw your own animal: Draw five animals – eagle, deer jaguar, serpent, and rabbit. Each animal relates to a human sense – eagle=sight, deer=smell, jaguar=sound, serpent=touch, rabbit=taste. This establishes a relation with nature. After the learner gets familiar with the parts of each animal, they are to draw their own animal by using a part of each animal. This lesson stimulates creativity and they draw their own unique animal. “Tonal Achtli, Semilla del Sol, Seed of the Sun”: This lecture includes a 29-minute video of my paintings that takes the viewer through a Mesoamerican visual literacy experience with the art, history and culture. The second part of the hour is open for Q/A and further discussion of the video. 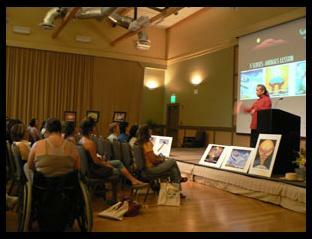 Tile Mural Workshop: This workshop introduces to the learner how an 8”x10” image can be painted as an 8×10 foot mural. This encourages group participation: each learner paints one small part of the mural which then completes the mural. The presentations are available for classroom and/or auditoriums.